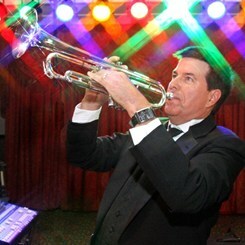 Larry Elliott teaches all levels of trumpet, cornet, and flugelhorn to both children and adults. In addition to basic technique (range, tone, flexibility, articulation and reading) his teaching includes and variety of performing styles, drawing on his caried background as a professional trumpeter. His performance experience includes concert band, theater pit orchestra, big band, classical, rock and popular music. Lessons are tailored to individual needs and individual musical interests. Sessions may include preparation for band concerts and solo festivals, or remedial work for kids who are struggling to keep up in school band. Larry has a degree in Music Education from Frostburg State University, and has also studied trumpet with Dr. Ernest Wolfle and Dr. Donald Reinhart. Currently, Larry leads the local wedding band "Retrospect", playing trumpet, flugehhorn and keyboard, in addition to handling the band's bookings and serving as sound tech, lighting tech, and MC. Outside of the music studio, Larry is a PSIA-certified professional ski instructor at Ski Whitetail in Pennsylvania, where he teaches skiing on weekday mornings each winter from December through March. Request Lessons with Larry Elliott today!